The tasting room at Shelburne Vineyard in Vermont. 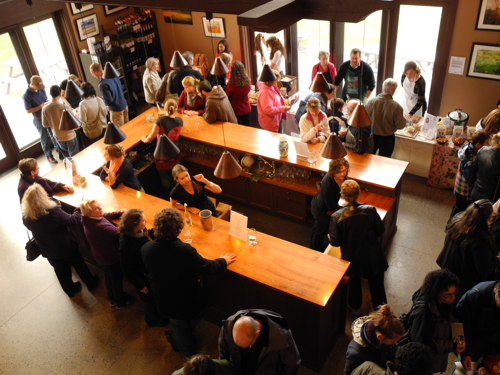 Shelburne won “Best of Show” for their ’10 Marquette Reserve at the 2012 Cold Climate Wine Competition. For the most part, the wines that you drink today are made from the same grapes as the wines your grandparents and great-grandparents drank. The great wine grapes of the world have been around for several hundred years, and some of them for much longer than that. For example, the Georgian grape Rkatsiteli is thought by some authorities to date back to 3000 BC, while the Greek grape Limnio was reputedly mentioned by Aristotle and Hesiod in ancient Greece. Those are extreme examples, but even Chardonnay can be traced back to the 16th Century while Cabernet Sauvignon was first mentioned in the late 18th Century. And then you have a grape like Marquette. Marquette (named for 17th Century Jesuit missionary/explorer PÃ¨re Marquette) has only been available to the public since 2006, though the original cross responsible for creating it happened in 1989. It was created by Peter Hemstad and James Luby at the University of Minnesota, which has become one of the foremost cold-hardy grape breeding facilities in the United States. The Marquette grape is a complex hybrid grape, which just means that it has more than two different grape species in its lineage. A simple hybrid would be the result of a crossing between two grapes that were of different species and which had no other species in its parentage. For example, a pure Vitis vinifera crossed with a pure Vitis labrusca would produce a simple hybrid. If we crossed this simple hybrid with a pure Vitis aesitvalis, the resulting offspring would have three different species of grapes in its lineage and it would be a complex hybrid. Marquette actually has eight different Vitis species in its lineage. In addition to Vitis vinifera, there is also Vitis riparia, labrusca, aestivalis, lincecumii, rupestris, cinera, and berlandieri, all of which are different North American species of grapevine. 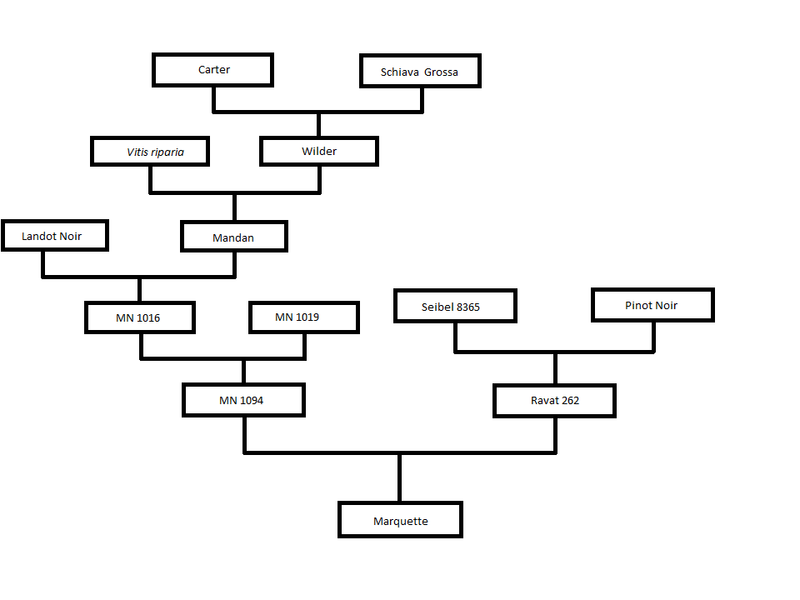 The pedigree map below is not complete, but it does show some interesting relationships in Marquette’s close family tree. Marquette is the result of crossing MN 1094 with Ravat 262, neither of which are commercially important in their own right, but we can see that Ravat 262 is a direct offspring of Pinot Noir, making Marquette a grandchild of Pinot. Though Marquette is a very young grape, it is proving popular with growers in cold climate states. Minnesota leads the way with just over 200 acres planted (as of 2007 and certainly much more today. ) 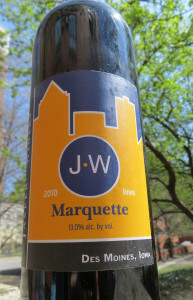 Marquette is now the most popular wine grape in Wisconsin with 67.8 planted acres in 2011. There were 16 acres of Marquette in Illinois in 2011, 10 acres planted in Indiana as of 2010 and 6 acres in Iowa as of 2006. It is prized in these areas because it is extremely cold hardy, regularly tolerating temperatures between -20º and -30º Fahrenheit (and at least one report of a vine surviving -36º conditions with no injury.) It does bud early, which can be a problem in frost-prone areas, but secondary buds can also be fairly productive. Marquette has good resistance to downy mildew, powdery mildew, and black rot and ripens around mid-September in central Minnesota. The grape is typically made into a dry table wine that is characterized by black fruit and earthy notes with some ‘typical hybrid” aromas and flavors as well. The grape can suffer from high acidity when picked, but malolactic fermentation and barrel ageing can help to keep this in check in the finished wine. One of the interesting ‘side effects” of Marquette’s being such a young grape is that the University of Minnesota actually has a patent on it, and those interested in growing the vine must buy their planting materials from a nursery licensed to sell them by the University. 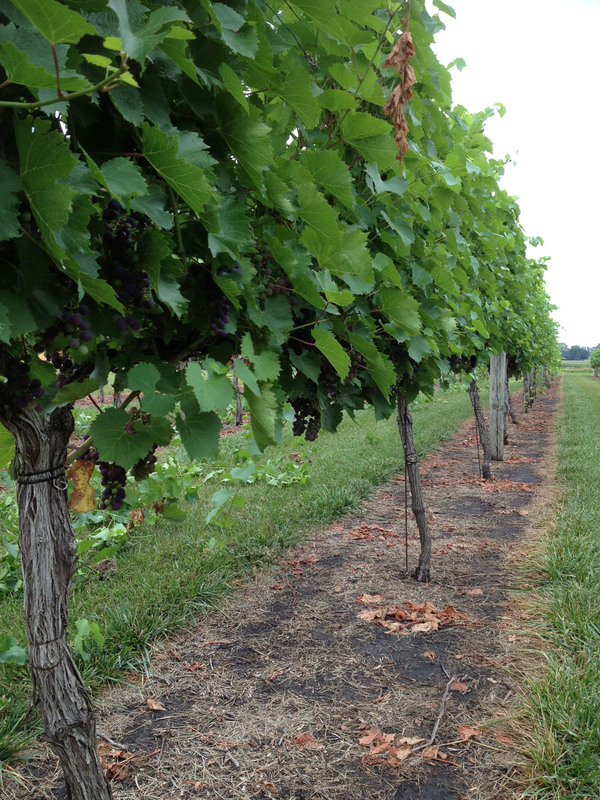 Furthermore, individuals are not permitted to asexually propagate their vines without a license from the University. Think of it like a modern best-selling novel. You can buy the book from a bookstore or borrow it from a library, but you can’t make copies of it and sell them to your friends. Chardonnay, on the other hand, is public domain, and while you can go down to the bookstore and buy a copy of it, there are other free(and legal) ways to get your hands on (and share) the materials as well. Whether Marquette wine will stick around long enough to become a ‘world classic” like Chardonnay or Cabernet Sauvignon is something that only time will tell but it is certainly off to a fast start. Homepage photo: Gerry Barnhart, Victory View Vineyards, Schaghticoke, NY with in his Marquette vineyard. Rob Tebeau is the publisher of the Fringe Wine website where you will find one-of-a-kind information on hundreds or grapes. There are a couple other vinifera varieties in Marquette’s lineage…..if you trace the parentage of MN 1019 mentioned in the diagram above, you’ll find Cabernet and Merlot as well. So, Marquette has some very noble genes in its ancestry! I didn’t know that about MN 1019. That’s really interesting! Hi Rob – Here’s a link that might be useful to you: http://chateaustripmine.info/Parentage.htm This is a website that has more-or-less complete parentage info for many hybrid grapes. If you scroll down then click on Marquette, you’ll see a parentage diagram that shows where Cabernet and Merlot was involved. Hope this helps. Try to tell people in Alexandria or Barnum or Hugo, MN how extremely cold hardy this variety is. You just might get an argument. Need to get out my map, but thanks for letting folks know that Marquette is not infinitely cold hardy. We have written about winter die off problems with Marquette in MWP.